I heard a cool talk today by Ted von Hippel from the University of Texas. His seminar dealt with disks around white dwarfs. This subject began twenty years ago with a paper by Zuckerman and Becklin titled Excess infrared radiation from a white dwarf - an orbiting brown dwarf? The answer was no - the IR emission appears to arise from a dusty ring around G29-38. 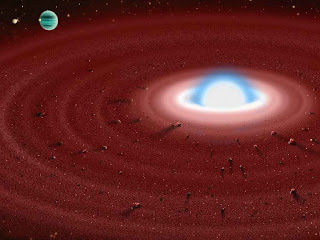 Five such dust disks around white dwarfs are now known. More tomorrow!